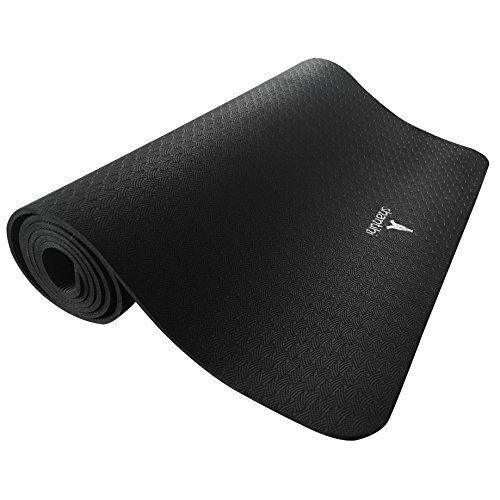 Shantihi Yoga Mat - Thick Eco Friendly Premium TPE Yoga Mat. Non Slip, Reversible, Lightweight, Durable Exercise Pilates Mat. FREE Bonus eBook. 72”x24”, 5mm. Product prices and availability are accurate as of 2019-04-03 14:44:18 EDT and are subject to change. Any price and availability information displayed on http://www.amazon.com/ at the time of purchase will apply to the purchase of this product. Are you tired of using a yoga mat that smells of stale sweat and is still wet from its previous use by someone else? Are you looking to commit to better health? Shantihi, or Shanti, means peace in Sanskrit. As a yoga practitioner and teacher, it is Shantihi Yoga's founder's hope that her products would inspire people to make healthier choices by introducing balance and peace to people's lives. - Buying your own personal yoga mat will get you motivated to exercise regardless if you are practising at home, at the gym, at a yoga class or travelling. - Have peace of mind that you are keeping yourself and the environment safe. This SSG certified eco friendly premium TPE yoga mat is recyclable, hypoallergenic and free from harmful chemicals. - Find your perfect balance. Our mat is comfortably thick to cushion your spine and joints yet firm enough for balancing poses. No more wobbly tree pose on spongy mats! - Keeps you steady and grounded with its double-sided anti-slip textured surfaces. Hold your poses with confidence. Note : For hot yoga, search for our Shantihi Hot Yoga Towel which we recommend you use on top of your mat for better moisture absorption and increased traction. Save more when you buy multiple yoga mats. Click "Add to Cart" now to invest in a sustainable practice and why not choose another color for your yogi buddy too? Check out our other products for more discounts with purchase. Search for Shantihi Yoga Towel or Shantihi Yoga Strap. Here's to finding peace on your new mat.  HYGIENIC AND WATERPROOF : Practice on your own clean and fresh yoga mat instead of sharing studio mats. This mat's waterproof surface repels sweat, germs and dirt, keeping bacteria and that dreaded stinky stale sweat smell at bay. Washes easily, just spray and wipe clean.  ECO FRIENDLY, PVC FREE AND ODORLESS : A little bit pricier but much better for you and the environment. TPE is the latest technological improvement to the traditional yoga mat. This material is non-toxic, free from PVC, phthalates, silicone and other harmful chemicals. Unlike rubber mats, TPE eco mats have no strong rubber smell and is safe for those allergic to latex.  NON SLIP, DURABLE AND TEAR RESISTANT : Tired of your cheaper PVC and NBR foam mats disintegrating? This dense anti-tear TPE mat is designed to withstand any vigorous workouts, home exercises, Pilates, Bikram or Ashtanga yoga. Being reversible, you can use different high-traction non-slip textures on both sides, lengthening your mat's lifespan. Saves you money in the long run.  LUXURIOUS COMFORT, LIGHTWEIGHT AND TRAVEL FRIENDLY : Love your thick Manduka, Jade or Lululemon mat but finding it heavy to carry? At 5mm thick, our lightweight and portable mat provides the perfect balance of cushioning and portability without compromising your balance. Great for yin yoga, travels or when you are on the go.  100% YOGI SATISFACTION GUARANTEE : Designed in New Zealand with love. If you are for any reason unhappy with your Shantihi TPE Eco Yoga Mat, we will provide a 100% money back guarantee. Please enjoy our FREE bonus "10 Best Restorative Yoga Poses to Relieve Stress" eBook with your purchase.